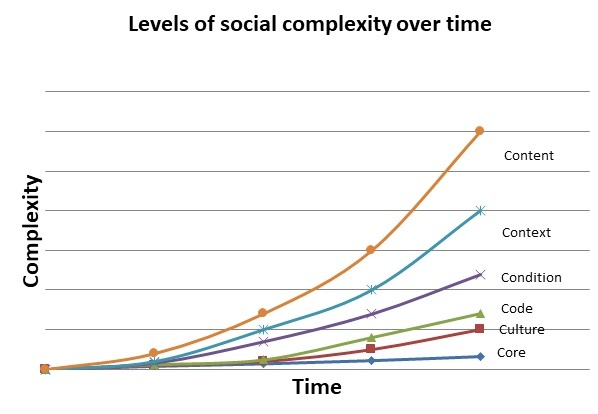 As governance of social systems such as nation states become more complex over time, the distance between the citizenry and the social structures built for their benefit tends to grow. This results in a sense of victimization in citizens and a loss of accountability in leaders, as an increasingly-centralized government fails to meet the expectations of the people it is intended to serve. The discrepancy between content (an increasingly intricate social reality) and the society’s tools for coping with these changes creates a dangerous incoherence (Beck & Cowan, 1996). The goal, of course, is not to hold the advancement of the society down to the level of its existing culture, but to grow the society’s core, culture, and code at a pace that does not generate destructive conflict (Beck & Cowan; Ichak Adizes, 1996; Jay, 2010a). A number of societies at a similar level of growth as Iceland have moved toward technocracy, where all major input for public policy making is in the hands of specialists and the public is not trusted to interfere in the process. The Iceland process argues that it should be the other way around: specialists should not be trusted to reign over the evolution of a society and citizens can be trusted to provide essential guidance. It is evident that there are great social imbalances and biases in most industrialized societies, and that changes are necessary in these human systems to promote resilience, health, and sustainability. It would seem wise to ensure citizen input in the visioning of needed changes. Human development progresses through a shared sequence. We have a tendency to judge the future by the past, evident in statements such as “We have tried this before”, “Every cloud has a silver lining”, “There is nothing to worry about; this is not the first time”, and so on. If our thoughts delude us into perceiving a situation differently than it actually is, we may find a very serious trap awaiting us. The Assembly Process is a way to take participants out of their accustomed thought patterns and give them a fresh look at their situation. It helps them to not only envision a desired future, but shape their thoughts toward making that future a reality. Most governance structures in today‘s societies were developed and implemented prior to the ‘Internet Age’. Evolving social media platforms are still in their infancy and fall far short in their current forms to play a constructive and systematic role in large-scale social change and governance processes. Rapid developments in technology for electronic collaboration (social media with a purpose) will open new dimensions for harnessing momentum – eg: collaboration will be based on the needs of citizens themselves and with their own participation. From the Wall Street Occupy Movement, to the Arab Spring which swept much of the Middle East, to the unrest overtaking many other developed economies, I believe that the tools and techniques discussed in this chapter together with a paradigm shift in communication technology hold promise for engaging the populace in the social and governmental changes now unfolding across the world. I believe that we can and should use these tools and techniques to engage those who are subject to socioeconomic forces to shape those very forces toward the greater social good. The Assembly Process, developed with the aid of Participatory Action Research (Stephen Kemmis & Robin McTaggart, 2005) and Grounded Theory (content analysis) (Kathy Charmaz, 2005), can establish a base for unity within a given social system. Humberto Maturana & Francisco Varela (1987) outlined the importance of interpersonal communication within a human system to its unity and growth. An authentic public sphere, in which participants can express their thoughts in a safe and uncritical environment, is necessary for social learning and to harness collective intelligence. This enables genuine joint meaning-making through sharing of experience and storytelling. The result is a representative view of the desired identity, values and vision. The assumption that any human social system must grow and develop on its own terms is guided by SDi (1974), originated by the late Clare W Graves, former professor emeritus of Psychology at Union College, New York. The theory was further developed by Don Beck, who with Chris Cowan, described it in their book ‘Spiral Dynamics: Mastering Values, Leadership and Change’. SDi assumes human emergence as an open-ended evolution, occurring in stages according to the complexity of prevailing life conditions. Another significant theory supporting the above assumptions is the concept of lifecycles of living systems (Adizes, 1999). It holds that a human social system’s evolutionary level may be gauged by studying its problems of existence (its level of unity or disintegration and, therefore, the degree of adaptation to its environment) and framed in terms of its position in a lifecycle. Maturana & Varela stated that, when a destructive interaction between a living being and its environment occurs, the former disintegrates and loses its ability to adapt. Adizes pointed out that lifecycle stages could be classified as either growth or ageing. Many problems of existence experienced during the growth era are normal, while some could be abnormal or pathological. On the other hand, all problems of existence experienced in the ageing part of the lifecycle are, by definition, abnormal or pathological; the system is disintegrating from the environment and ultimately within itself, losing its adaptation. Another important factor in the adaptation of living organisms is autopoiesis. This concept was first developed by Maturana & Varela, who stated that living systems are characterized by 3 principal features: autonomy, circularity and self-reference which enable them to self-create or self-renew through closed systems of relations. The Assembly Process invited and evidenced this self-organizing principle of human systems. Nation Building. A citizens’ communicative engagement organized by a government to capture the diversity and consider the way forward for the nation or to consider an issue of such national importance that it would require extensive public input. In this instance it is fair to assume that a vast array of remarks would appear from the crowd involving all aspects of the society. The government authorities would regard the respondents as a ‘sounding board’ in controversial issues for further policy-making. In a geographically large and culturally diverse setting, more than one event might be organized simultaneously. The complexity of the data would be such that categories would encompass larger subject areas. There are also other complexities relating to the placement of authority within different social institutions, be they formal or informal. Community Building. A communicative engagement involving a particular community, organized by local authorities and/or sponsors of some kind. These would typically be organized around a common goal such as employment opportunities, innovation/startups, community projects and so on. Participants would present issues of a systemic nature in community building, as well as specific ideas for their own collaboration. The organizers would then be tasked with strategizing and monitoring results. Stakeholder groups in this smaller setting may be better aligned with overall goals, making it easier to establish the necessary combination of authority, power and influence. Organization Building. Since the first Icelandic National Assembly, held in November 2009, many such events have been organized in Iceland using the Assembly Process. These typically involve most or all of the organization’s employees, but in large organizations may involve multiple (not necessarily simultaneous) events tailored to the unit in question. Issues resulting from these sessions typically fall into the same categories as those of a National Assembly. In an organizational setting, authority, power, and influence are usually determined by corporate hierarchy. My experience in Iceland and beyond, plus the theoretical frameworks that informed this experience, indicate there is a way to engage the collective intelligence of a community, even as large as a nation. This collective intelligence can provide essential direction and a helpful influence on the healthy emergence of what is next for a community or nation. Transformation can be intentional.